Pepe and I are going to celebrate our 5 year wedding anniversary this week (wow, time flies). Anyway, as I've been decluttering (seems like a theme of posts this week) and throwing away old receipts, I came across these 3 receipts. Yes, all 3 are in Spanish. Red Lobster (Langosta Rojo) - No, this isn't the chain restaurant. It was a a cute little place in the town of San Felipe, Mexico. Pepe and I went here on our honeymoon and this restaurant was amazing! 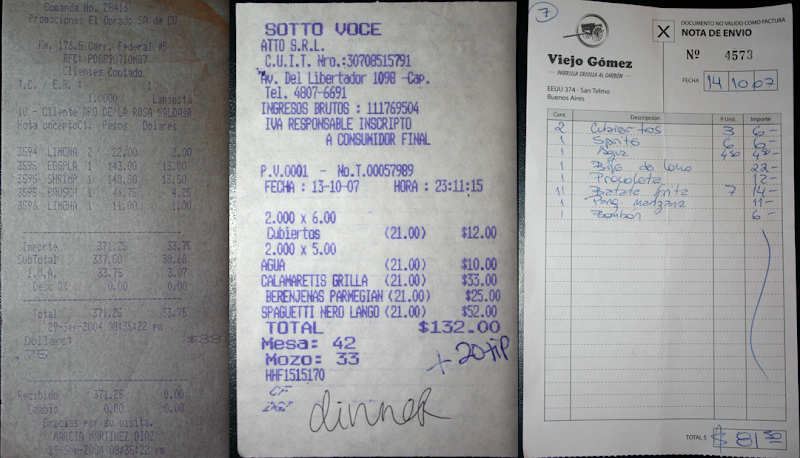 I think we had 3 servers and the food was delicious. We ate outside . . . romantic. Pepe had Black Spaghetti with Lobster - I'm not joking, this was amazing and I'm not a lobster fan. The spaghetti is black because it is dyed with squid ink. Viejo Gomez - The last day Pepe was in Argentina with me, we went to this restaurant. You know how most places have a bread bowl or chips and salsa to hold you over till your food gets there, well this place serves homemade empanadas. They are amazing! Pepe had Steak - seriously, the best steak Pepe and I have ever had. Some other AMAZING restaurants we have eaten at: Lauriol Plaza, Legal Sea Foods, lots of places in Costa Rica, Da Marcos, Cumana. Do you have a favorite meal or place you've eaten at? I never got to go to that Costa Rica place...maybe next time.